Do you receive a message via in-game mailbox like this? What is it? Now, this guide(written by AlmightySor)will help you understand the Solo event and Hell event, and it's targeted for all those newbies who don't understand how this events work, It will also explain how to calculate and time your Research,building and troop training,so that you can get the best possible rewards. 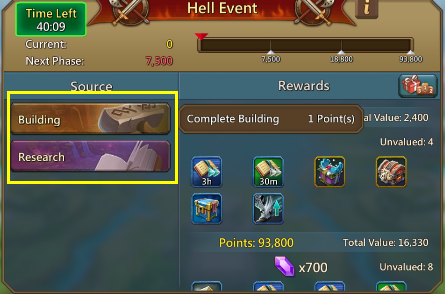 The 2 Events : Solo and Hell. And then let see the information that regards both events equally. Both events are said to be server-wide,everyone on the server,all of the kingdoms see the same event as you are. How do the events work ? Both events are built on the same concept, there is a 3 phased reward system, each phase requires a Certain amount of points (cumulative to the higher phase rewards). Every phase gives it's own rewards. One very important thing to mention! 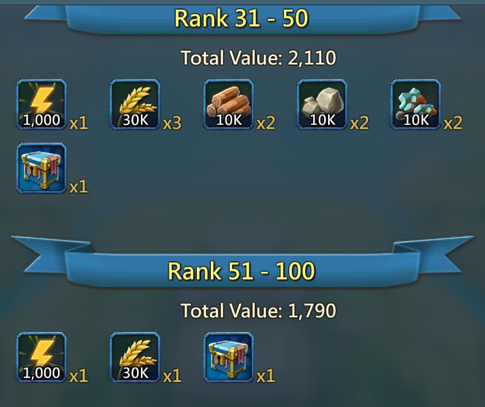 The rewards depend on the amount of points required for each phase, the higher the requirement, the better the rewards will be. Each phase completed grants you it's reward. The first phase usually gives resources and occasional speed-ups. It usually doesn't require much points as you can see above, but the rewards are nothing to brag about. Third Phase is where it starts to get really interesting,we will elaborate on this level later in this guide because it's usually different for both events. Points = Might for a finished operation. So what gives the most points ? by construction) in your hero talent tree. speeding up the research when needed of course. Tier 1 troops = 1 point each. Tier 2 troops = 2 points each. Tier 3 troops = 5 points each. Tier 4 troops = 15 points each. For example a lvl 11 quarry takes 9+ hours (original time) but gives only 307 points (might). it for event rewards because it usually isn't worth it. being in this top 100. You'll know if you got top 100 at the end of an event cycle.You will get a message with your prices and what rank you achieved. 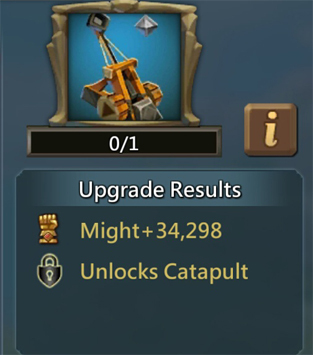 The better the rank group the better the prices, but even places 51-100 get a decent price.It gets harder and harder though to be in the top 100, as you progress with castle levels. next cycle, it will show you the next cycle condition. speedups, boosts and loot boxes. 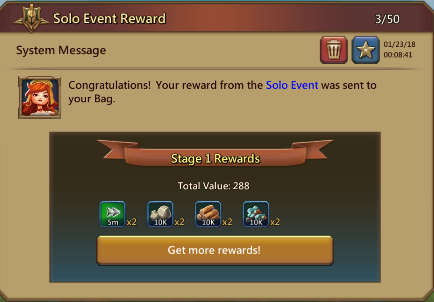 Solo event phase 3 points needed isn't high usually,it's about 7000 to 30000 usually. Obviously the more points needed the better the price.When it gets into 20k + which is hard to get, the prices get real interesting offering gems or many loot boxes. Again, it's quite random and you might get a demanding and rewarding event, or relatively easy. The event starts every round hour and lasts for 55 minutes. The remaining 5 minutes are like in solo event, preparation to the next cycle. This event usually asks for one or two of the point types. But it can be 3 at times, though phases are demanding. Phases 1 and 2 are about the same as Solo event as described earlier.But the tougher the requirements, the more points needed per phase. 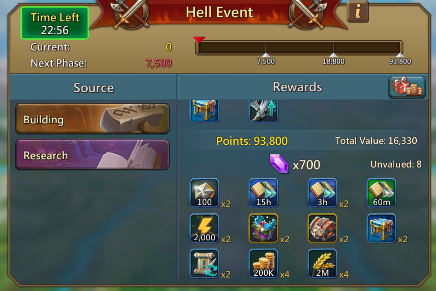 Hell event is less consistent than solo as far as requirements go. Phase 3 is something else entirely mostly. can't get there.But when the phase 3 is above 17k points needed, the prices usually contain gems. Hope you guys enjoyed, so some tips to conclude long guide. 1. Always have spare gems . 2. 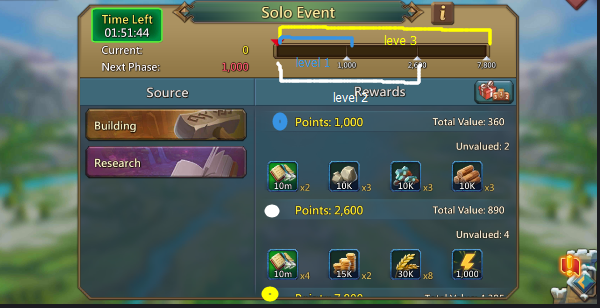 If you are researching something that gives 10k+ points, even if u use them on the research, keep 2-3 hours to give you the chance to find a good opportunity to time your events. 3. try to train an amount of troops to be ready with your research. 4. Time your high points to when you are available to play the game, shame a day worth research will go to waste. 5. Make it that most of your research wait time will be at night when you are a sleep. So hope you guys enjoyed my guide, you are welcome to reply and add tips or find any faults in this guide. Good luck!